July 2015 Cancer Horoscope forecasts that you can go ahead with your plans this month. You will achieve what you want without any opposition or outside help during the month of July 2015. Family and spirituality will become more important over career and real world issues. Love, finance and good fortune will come knocking on your doorsteps! This is also an excellent month to buy or sell homes. In your professional life, the Cancerians can expect recognition and rewards for the hard work that they have put in. You will get opportunities to exhibit your expertise which may result in new and better jobs. Professional and business matters will require touring in July 2015. It is always better to plan for the long term rather for immediate short term gains. 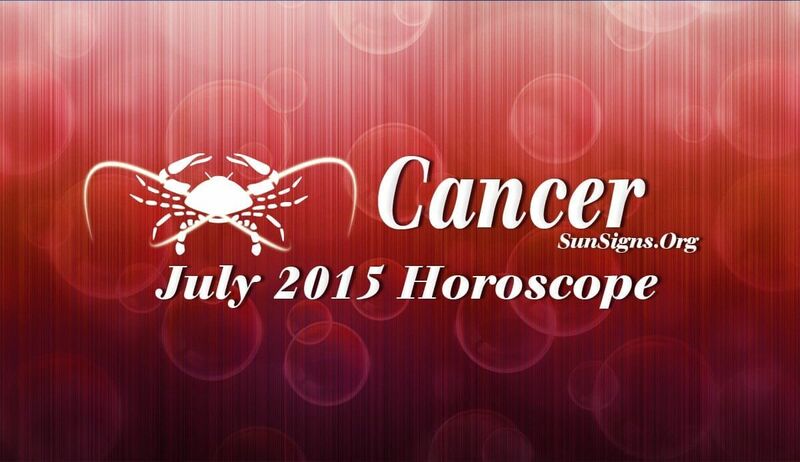 The Cancer 2015 July horoscope foretells that monetary prospects are fantastic this month. Wealth is created effortlessly during this period. Your intelligence with respect to saving money improves drastically. You will come up with new ideas to improve your financial status. July 2015 is a month that encourages excellent love compatibility between couples. Singles will start dating online to make new love relationships. You can share your feelings with your partner. Family environment for the Crabs will be pleasant with lot of fun and excitement and the month is auspicious for changing residence. This month is also fortunate for getting pregnant. Diplomacy and kindness will be the essence of your domestic life. The Cancer July 2015 horoscope foretells that your health does not pose any problems during the month. In addition to fitness you will be more interested in improving your outward appearance. It is always better to take precautions with simple home remedies, if you feel you are keeping unwell.